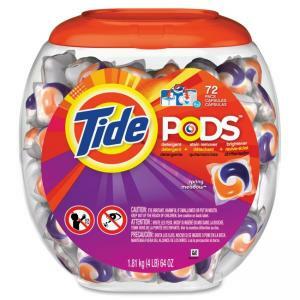 Tide Pods clean laundry, fight stains and brighten in one convenient detergent pack. No more pouring, no more spills. Simply toss one in the washing machine drum of your standard or high-efficiency machine. It's that easy. Each pod contains detergent, stain remover and brightener. Innovative, multi-chamber design separates ingredients until they hit the wash for outstanding cleaning power with a Spring Meadow scent. Safe for both whites and colors, the formula is designed to prevent over-sudsing while also giving a great clean. Use one pack for one load. The Pod dissolves quickly in hot or cold.